Last year Vodka Cruiser posted an Instagram image of a minor wearing sparkly make-up which was viewed as being marketed to children. While Australia has been slow to address the issue, in the UK big alcohol brands such as Diageo and Carlsberg teamed up with tech giants Facebook, Snapchat, YouTube and Twitter to tackle the issue of alcohol advertising on social media. The partnership, which was announced last month, will give viewers the option to opt out of alcohol ads in an effort by the companies to practise responsible advertising. The decision by ABAC comes after an Australian study found that alcohol brands were violating rules by using actors who are perceived as being under the age of 25. Released in May, the study found that of a group of 351 heavy drinkers (those consuming 11 or more standard drinks per drinking occasion) aged 16 to 19 years old, 94% thought the character in a liqueur ad was under the age of 25 years. It also found that close to 30% believed the advert was marketed at people under the age of 18 years. 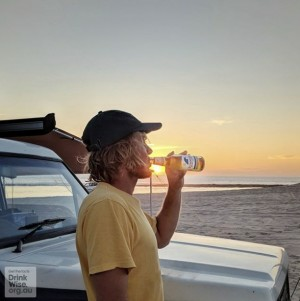 The Alcohol and Beverage Code (ABAC) adjudication panel has ruled that XXXX Summer Bright Lager, Wilde Beer and Furphy have all broken advertising rules on social media after a complaint was made by Cancer Council Victoria. The brands repeatedly used young travel bloggers to promote alcoholic products on Instagram and Facebook while failing to restrict their accounts to followers aged 18 years or over. According to rules developed by the industry itself, advertisers are not allowed to feature adults under the age of 25 unless they are unpaid and in an adult-only setting. Cancer Council Victoria’s alcohol legal policy advisor Sarah Jackson says alcohol brands are increasingly using social media to target younger consumers. “Alcohol brands are eager to market their unhealthy products, which are known to increase the risk of cancer, to young people and will go to great lengths to develop positive brand relationships from an early age,” Jackson says. While the Cancer Council welcomes the decision from the ABAC panel Jackson says it wants to see government regulate social media advertising for alcohol brands. “Alcohol use causes eight different types of cancer, along with other diseases, and fuels assaults, accidents, injuries and deaths. It is insidious and wrong for alcohol companies to use desirable social media influencers, who children look up to and aspire to be, as a tool to advertise their unhealthy products,” Jackson says. Alcohol advertising on social media has been an issue in the industry for years with the ABAC previously finding that both Vodka Cruiser and 5 Seeds Cider also violated industry-made rules.